Well, the Winter Solstice is almost upon us, and this Friday Druids and Pagans of various types will probably be vainly attempting to discern the disc of the Sun through an impenetrable layer of cloud at Stonehenge. If they are lucky, they may well avoid a thorough drenching, but it strikes me that if there is not already a god or a goddess in their pantheon that rules over the rain, then one should certainly be invented or adopted: Thunor perhaps? Surely, if Britain were to have a national deity, it would take the form of a cloud. The foreign stereotypes of ‘foggy Albion’ need to be updated to a more appropriate ‘sodden Albion’. We do not enjoy, contrary to the assertions of some predicting certain climatic shifts a few years ago, a climate akin to that of Provence. Last week’s census results illustrated some interesting shifts in religious affiliation across England and Wales, with a notable surge in the number declaring themselves to have ‘no religion’ whatsoever. However, there was also growth in the number of those following fringe religious beliefs, which although claiming deep historical antecedents, are in reality relatively modern creations that have drawn upon scattered historical references, as well as in some instances the customs and practices of non-Western Shamanistic cultures, to create systems of belief that many find to be symbolically and emotionally satisfying. Some find that they possess a need for what they would term the ‘spiritual’, and so far as ‘spirituality’ goes, neo-paganism in its various forms is generally relatively benign. 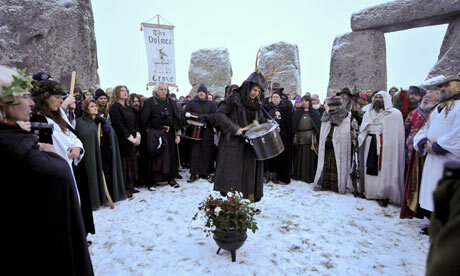 Across England and Wales the 2011 census revealed that the number of people identifying themselves as Pagan rose to 57,000, with an additional 18,000 describing themselves as Druids, Heathens and Wiccans. All of these share a certain romanticised view of nature and the past and are deeply rooted in a sense of attachment to place and people. It isn’t quite a British equivalent of Shinto, but it’s about as close as it gets. Thankfully, the negative elements of the old religions such as human and animal sacrifice alluded to in fragmentary fashion in the texts of Tacitus and other contemporaneous authors are absent from their re-imagined variants, but even amongst such a disparate body of people as neo-pagans, the occasional ugly demand that their beliefs be ‘respected’ can be encountered. In 2006 for example, Paul Davies from the Council of British Druid Orders described as “immoral and disrespectful” the display of Neolithic human remains in Avebury’s Alexander Keiller Museum and requested their reburial. Quite why he, rather than you or I, should be able to say how they ought to be treated is beyond me, for it is no more likely that he bears any closer relationship to those bones than we do, and I would prefer that the remains of our distant ancestors were made available for scientific analysis rather than reinterred. As we move towards what looks set to be an unenviably soggy rather than a white Christmas, my thoughts will for a few moments this Friday morning turn towards Salisbury Plain, as I ponder the fate of the pagan party braving the elements early on a wan December day. If nothing else, it will bring a little colour to a drab time of the year, which quite rightly has over the ages given birth to a host of celebrations, whether they happen to have been focused upon the Solstice, Yule, the Saturnalia or Christmas. Personally, I’m happy to celebrate them all, partaking of the good humour that comes with festive food and drink. Anyone for an ale or two? Talking of which, take a look at this delicious and appropriately named beverage. Cheers! Whilst on a wintry note, for your enjoyment below is Laura Marling's wistful 'Goodbye England (Covered in Snow)'. Alas, a good part of it may once again be covered in flood water instead. Some of us diehards still put Jedi in the 2011 Census as their religion. "According to 2011 census figures, the number of Jedi had fallen to 176,632, placing it in seventh place, having been overtaken by Judaism and Buddhism, but still comfortably outnumbering any other alternative or mock religions"